When you think about running your community driven websites, forums comes in mind first as they are from a long time a single solution for running a discussion oriented websites. With sudden surge in popularity of question answer websites like yahoo answers, stackoverflow, blurtit etc. budding webmasters have started leaving the idea for running a forum and are looking forward to run their own QA websites. 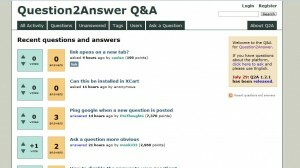 What made question and answer websites perform better than forum websites ? These websites are more direct as they provoke incoming users to ask questions and find their answers more directly than going to the painful procedure of joining the forum. They look better than forums and chances are more that a user will post question will always exist. Apart from dedicating a whole website to Q&A section you can also integrate your existing website or blog with a Q&A website. The advantage being that your readers will leave related questions to your blog and even unanswered they will drive search traffic. Sometime unanswered questions drive more traffic than answered one. Thats why AmitBhawani and labnol.org have started their question and answer portals. Question2answer script is 100% free open source script written in php mysql with Digg like voting system. 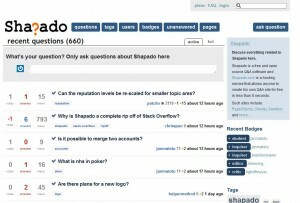 Shapado is written in ruby and is a clone script of stackoverflow. 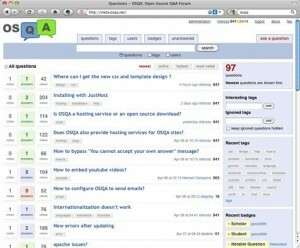 Qsqa is an open source script for a community question answer website and is written in python. AsBot is written in Python and works same as stackoverflow. Your post is very good …. always been a great help, especially this post. I only had the public on a website so you have to know something of this post ..